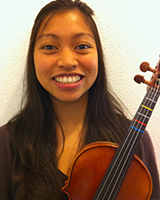 Melissa Atienza has been teaching beginning violin since 2009. She started learning the violin at the age of 10 in the Philippines from the University of Santo Tomas and St. Scholatica’s College, Conservatory of Music. Immigrating to the United States in 2008, she continued taking violin lessons from various teachers in California, among them are Gherman Markosian, Rem Djemilev and currently from Raphael Gold. She has played for the Golden Gate Symphony Orchestra and for different churches in the Solano and Napa communities. Melissa has been involved to several outreach activities teaching art and playing music for street children, people with disabilities, the sick and seniors since her childhood in the Philippines. She has continued these activities in the United States. These experiences enrich and give her insight into the power of music to heal and communicate. On top of teaching the joy of playing the violin, her goal is to also instill this spirit of outreach to her students.